Large Dog House free woodworking plan. If you own a large dog then these are the dog house plans for you. Build it using these free plans. Free plans to build a Dog House. Build your own dog house using these step-by-step woodworking plans. This one features styrofoam insulation. Dog House free building plan. Give your dog a little shelter from the sun when you build this dog house. At the link you will find free downloadable plans. Build this cottage style dog house using these free step-by-step woodworking plans. This dog house was built for a small to medium size dog but you could adjust to suit your needs. This modern dog house features curved walls with interior padding. Build it using these free woodworking plans. Build a Double Dog House. ild a double dog house with these free woodworking plans. Perfect for the family that has more than one pooch. With these free instructions a beginner woodworker should be able to complete this doghouse in a weekend. This is a link to a Google 3D SketchUp drawing for a doghouse for your pet. You will need the SketchUp software to download this drawing and its freely available online. This doghouse design features a removable roof for easier cleaning, and the floor is raised off the ground to keep loyal companions protected from rainy weather. Here is a project that is easily accomplished in one weekend. Make it a family project. 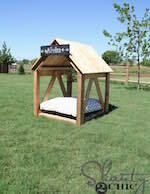 Scroll down the page at the link to find the downloadable plan to build this doghouse.